To ensure the life of the Vitroglaze®, we recommend that you use a clean damp cloth every couple of days and give the surface a wipe over and then dry with a soft cloth. If you do notice a slight build up of grime, simply apply some VITROclean to the surface and wipe over. Rinse with cold water and dry. 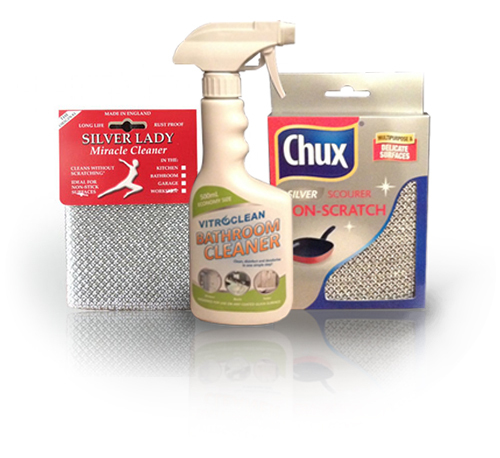 We recommend Chux Silver Scourer Non-Scratch sponge or Silver Lady Miracle Scourer. Vitroclean is a superb glass cleaner, shower glass cleaner and general surface cleaner specially designed for use on Vitroglaze coated surfaces. Click on the logos to find your nearest retail stockist. We stock glass cleaning products suitable for shower glass, marine glass, exterior windows, pool & exterior balustrades and all glass and surfaces coated with Vitroglaze glass protective barrier in our online shop. You can also purchase Vitroclean & Chux Silver Scourer Non-Scratch sponge online.